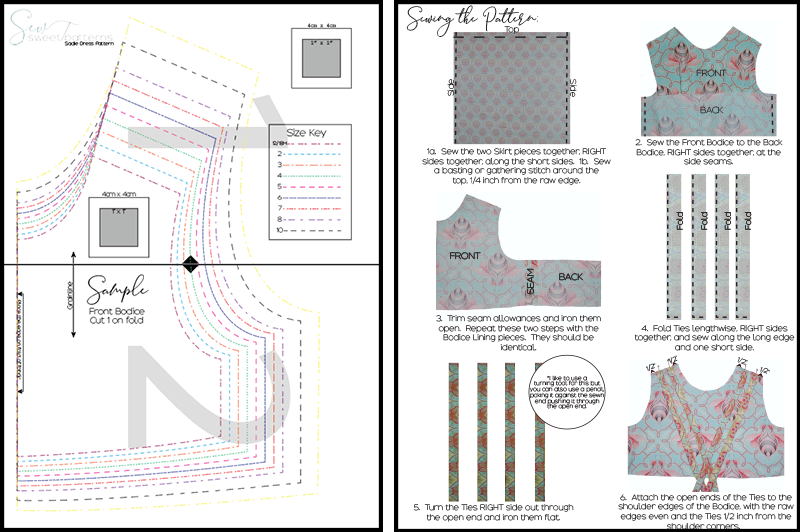 A PDF sewing pattern is a sewing pattern you purchase through an online store and is sent to your email. You then download the pattern and save it to your computer. Once downloaded, you can print the pattern pieces and tutorial from your home computer. No enlarging needed. PDF patterns are convenient and reusable. Unlike paper patterns, you can save our patterns to your computer and reprint over and over. A link to our pattern will be emailed to your email address you provide directly after purchase so you can begin sewing immediately. Our tutorials also include detailed step-by-step instructions for cutting out and sewing the pattern, including full color photos. Your PDF will be ready for download immediately after purchase by clicking on the words "Download the items you ordered" at the end of your order (this will be on the "Thank You" page). You may also download PDFs through your account at anytime by logging in, clicking on the order number of the pattern you would like to download and then clicking on the grey arrow on the top right of the photo. You will also receive an email with a link to your PDF immediately after purchase. This email will be sent to the email address your provided at check-out. You will need a printer and a computer will Adobe Reader installed. This is a free program you can download here. Yes, they are. All of our pattern pieces print at full size and do not require enlarging. Each pattern has a 1 inch and 4cm square test box on each pattern piece. This allows you to be certain that the pattern is printing correctly. If the pattern is larger than one sheet of paper, you will piece the required sheets together to get the entire pattern piece. Detailed instruction and pictures are included in each tutorial for printing and assembling the pattern pieces. (See sample pattern below). Actual pattern pieces are included, except when the patter calls for a simple rectangle. In this case, all measurements are given for each rectangle pattern piece. Yes, seam allowances are included for all of our patterns. While none of our patterns are very difficult, there are some that are geared towards beginners and others that are designed for those with more sewing experience.Please read the description of each pattern to determine if the pattern is appropriate for your skill level. We also have a difficulty chart that will help guide you to the right level pattern for your sewing skill. You will need to know the most basic sewing skills to complete our pattern and we are always happy to help along the way. Please feel free to email us directly or to use the Contact form on our website. No, the layer feature is not offered on all patterns yet. The listing description will clearly state whether or not this is a offered on the pattern you are viewing. We are working hard to update all patterns to offer this feature. The patterns that do not have the layer feature are offered at a lower price. No. Although some may choose to use a serger, our tutorials are written for those who do not own a serger. All patterns are made and designed by Sew Sweet Patterns. They are original patterns and for PERSONAL USE ONLY. This means you may use these patterns for personal use. You may sell the final product made from our patterns in a small scale, such a a home business. If you do chose to create items to sell, we request that you please link our shop in your sales listing, giving us credit for the design. Products made from our patterns may not be mass produced outside the home on a commercial scale. Please check your spam and trash folders if you have not received a link to download your pattern within a few minuets. Also be sure you are checking the email account you entered during checkout or the one assigned to your PayPal account. If you still cannot find you email, please contact us directly. No, we do not allow sharing. You may not forward, copy or distribute the purchased PDFs.